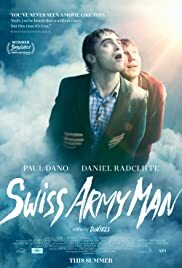 When you look up the word 'original' in your dictionary, you might find a poster of SWISS ARMY MAN next to the definition. This is simply the best movie of 2016 in my book. It's outrageous, it's visionary, it's full of humor and heart. To those of you who often complain that there's nothing original to watch in theaters anymore, writing/directing team Daniel Kwan and Daniel Scheinert have come to the rescue. Paul Dano plays Hank, stranded on a deserted island, about to commit suicide because to him, all hope is lost. And suddenly he sees a corpse named Manny (Daniel Radcliffe) who changes everything. Hank is determined to use his new multipurpose friend to go on an epic adventure that Hank hopes would bring him back to the woman of his dreams. 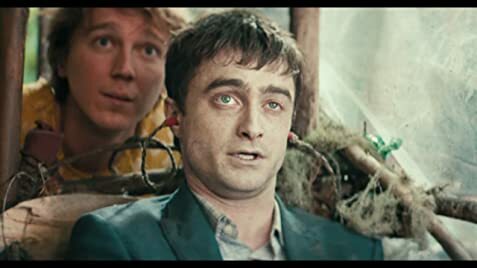 Brought to you by the guys behind "Turn Down For What" video, SWISS ARMY MAN is what happens when you let filmmakers run wild with their active imagination. It's a story about a man scared to take chances on love and life until a dead man who farts a lot has to show him how much fun letting loose and taking chances can be despite the outcome. Writing/directing team, simply known as DANIELS, pack this film with all kinds of surprises, like one of those nesting dolls, just when you thought you've seen what Manny can do, he can do another thing and another and it doesn't stop. And I'd like to see it as DANIELS channeling their limitless creativity through Dano's character, Hank, because Hank is the one who's got the skills to utilize Manny in order to create something that's either fun or simply useful. Never have I seen a movie that celebrates farting as much as this. Some might dismiss SWISS ARMY MAN as absurd but this film wears absurdity proudly like a badge of honor. And to me the fart jokes and the corpse jokes, the erection jokes, they even have Jurassic Park jokes, are all just the vehicle that drives this friendship story. You have one character who's dead inside, and one character who's literally dead, interacting in a way that looks insane to some, but DANIELS crafted in a way that makes Hank and the audiences feel hopeful at the end. So this ain't some kind of "Weekend At Bernie's" long lost cousin. Paul Dano and Daniel Radcliffe fully immerse themselves in DANIELS' vision, although I'm sure at first they may have had trouble imagining what they read on the script. But the commitment of those two actors is evident on screen, they don't hold back. Accompanied by fantastic and super catchy score/soundtrack, SWISS ARMY MAN is a cinematic celebration that you can't get enough of. Bound to be a favorite to many; bound to be an instant classic. 164 of 275 people found this review helpful. Was this review helpful to you?